Nanchane duddali is a jaggery based halwa . In Konkani, Nanchano means Finger millet/ Ragi and duddali means halwa. This halwa has a very different texture and taste. Generally it is said that the consumption of Ragi has to be increased in summer. This is because it has a cooling effect on the body. 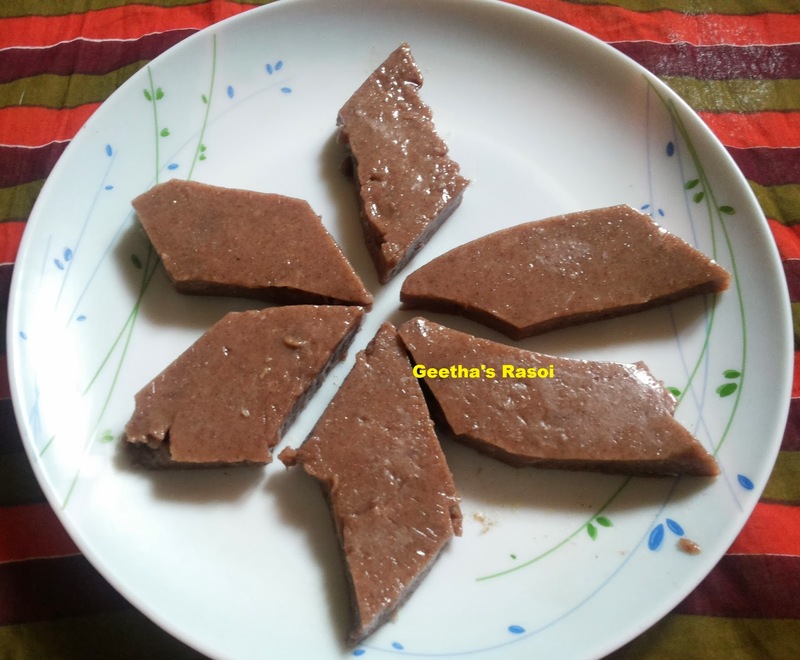 Try making this halwa and get the goodness of Ragi. Generally we use coconut milk for preparing this but here I have tried milk. i. Add 4 cups of water to Ragi powder and mix well and keep aside for 30 min. ii. After 30 min strain water. We get a thick paste. iii. Add 1 cup milk, 3 cups of water, jaggery and 1 tsp of ghee to the Ragi paste and mix well. iv. Then pour this mix into thick bottom pan and boil till it becomes thick and cook properly. Add cardamom powder to the thick paste and mix well if more sweetness is required you can add more jaggery. v. Keep stirring with a wooden spatula till it thickens and make sure it doesn’t attach the bottom of the bowl. vi. The mix has turned thick in consistency. if it does not stick to our hands it means it’s perfectly cooked. Grease a plate with a little ghee and pour the above mix and flatten it with the back of a spatula and cut it with a knife on cooling keep this in refrigerator and it tastes good when it is chilled.